Product review deluxe baby teething pain relief kit. 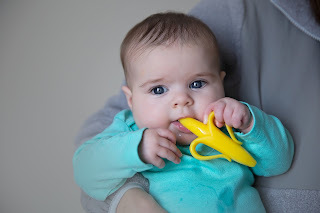 My brother just recently had a Baby girl about 3 months ago and she is starting to gum everything so my guess is she is a early teether so they gave her the banana teether to chew on and she loves it she sits there in her vibrating chair just gumming the crap out of the banana with out making a peep. then when she gets alittle fussy my brother or his wife will put on the clear silicone finger teether and let her gum that. all together she is a happy baby after letting her get these in her mouth. i recommend this product to anyone who has a Teething baby. 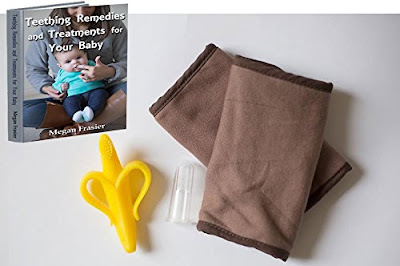 plus the PDF teething book is really helpful when you need more remedies and treatments for teething,. i received this Bundle Set for free in exchange for a honest unbiased review.